Zhang Daqian (1899-1983) is one of the most important figures in 20th century Chinese art. Never afraid to experiment, he took up the western method of lithography and produced prints in Chinese subjects of flowers, birds, and landscapes. He produced many of these prints in 1972 and 1974 while in San Francisco, including this print of a Cinnabar lotus. The inscription mentions lotus planted in the garden of the Hejian Temple in Luoyang, the capital city of the Northern Wei dynasty (AD 386-AD 534) as recorded in The Monastries of Luoyang, by Yang Xuanzhi (active in the 6th century AD). The lotus, rising and blooming above muddy water, is an important symbol in Buddhism, representing the achievement of enlightenment after experiencing and overcoming sufferings. 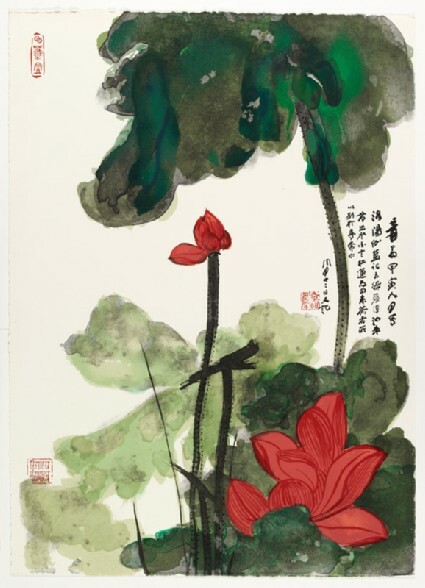 The artist Zhang Daqian was also a devout Buddhist and particularly favoured painting lotus. This print is among the sets of lithographs Zhang produced in the 1970s. The inscription reads "By the old man Yuan [Zhang Daqian] in September of a jiayin year. The monastries of Luoyang has it, "as green leaves float, the cinnabar lotus bloom above water." It does not say red but cinnabar lotus to distinguish them from the usual ones."